In our 2018 Picks to Click feature, we selected eight players or units from across the state each week that we felt would have breakout performances. We assembled a team of eight media members to select one player (or unit) each week and tracked the cumulative statistics of our selections throughout the season similar to fantasy scoring. Burdette completed 15 of 21 passes for 391 yards and eight touchdowns in the Eagles’ 62-16 win over Chase County. Burdette connected with Brock West 12 times for 382 yards and all eight scores. Burdette also rushed for 43 yards and a score. Mackley had a huge night in Weskan’s 52-46 win over Golden Plains. Jace passed for 313 yards and five touchdowns, and added 185 yards rushing and two more scores. Schroeder put another big game in the Cardinals 52-14 win over Independent. Schroeder passed for 353 yards and four touchdowns and added 24 yards rushing and three more scores. Biggs complted 6 of 8 passes for 133 yards and three touchdowns, and added 207 rushing yards and four more scores in the Leopards’ 42-14 win over Tescott. Dean passed for 291 yards and three touchdowns and added 83 rush yards and two more scores in the Grizzlies’ 52-15 win over Chanute. Kistner passed for 120 yards and four touchdowns and added 126 rushing yards and three scores in the Jaguars win over Marais des Cygnes Valley. Whisennand rushed for 185 yards and three touchdowns and passed for 162 more yards and two scores in Elkhart’s 47-6 win over Meade. Peters rushed for 296 yards and five touchdowns to lead the Mustangs to a 33-19 win over Newton. Peters also had one catch for 22 yards in the game. Greenwood rushed for 247 yards and four touchdowns on 33 carries in Burlingame’s 58-8 win over Southern Coffey County. He also completed one pass for an 18-yard touchdown and had four receptions for 41 yards. 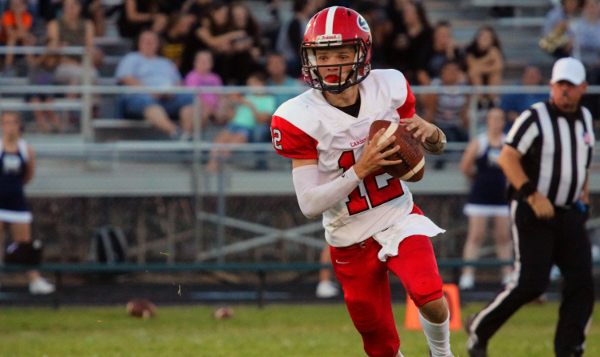 Buessing completed 18 of 25 passes for 219 yards and six touchdowns in the Eagles’ 54-6 win over Pike Valley.